The therapeutic use of essential oils in the framework of aromatherapy has become a fact of life. 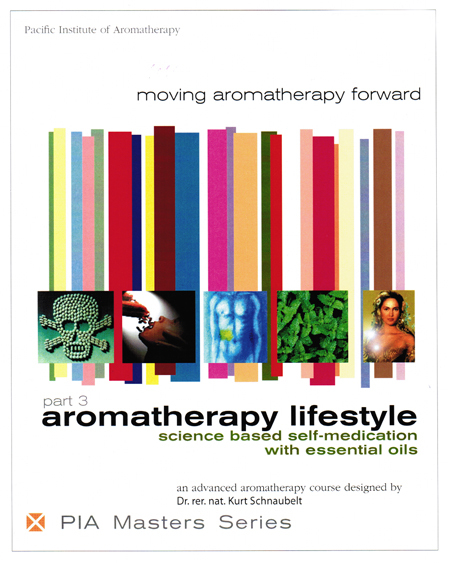 As aromatherapy has grown and diversified it has become clear that the idea of generating scientific data to convince the medical mainstream has given way to an understanding that the most rewarding features of essential oil use cannot be adequately described with the language of reductionism, but rather with narratives from more wholistic disciplines. Nonetheless, this Part III of the PIA Masters series focuses on those aspects of essential oil therapy which do correspond to the western pharmacological paradigm. Part III will guide the reader quickly and easily through the precautions to safe and effective applications of essential oils. Specific attention is given to combining pertinent practical information with an overview of the latest research results acknowledging the efficacy of essential oils for a broad variety of conditions. An introduction to the practice based on the scientific foundations laid out in Volume 1 and 2 discussing French Style Aromatherapy, British Style Aromatherapy, the special qualities of essential oils with respect to aromatherapy. Other topics discussed include: Why Is There So Little Research? How do Essential Oils Work? Legalities of Aromatherapy Practice and Drug Approval is Only For a Few! Deliberations around the issue of choosing alternative or conventional modalities. Topics include Conventional Medicine – Monopolizing Disease, Children Who are Always Sick, Beyond Antibiotics and Where Alternatives Do and Do Not Work. There is endless ingenuity when it comes to adulterating essential oils. Adulterants are not always synthetic, many adulterants are of botanical origin hence natural, yet they still offset the balance of the authentic oil. The Fallacy of Reconstituted Oils and Why Are Authentic Oils So Different? Intensive Treatment of Acute Conditions. Antibiotics are not Effective Against Viruses. Why Essential Oils have Antiviral Activity. Herpes Simplex – Unrivaled Efficacy. Sinusitis. Tonsillitis. Rhinitis. Bronchitis. Severe Acute Bronchitis. Chronic Bronchitis. Cystitis – Bladder Infection. Post Antibiotic Syndrome. Intestinal Infections. Conjunctivitis, Pink Eye. Ear Infections. ANS and the Digestive Tract. Managing Stress, Anxiety, Insomnia. PMS and Menopause. Immune System Issues. Bay Laurel and Lymph Nodes. Allergies. Arthritis Pain. Travel or Motion Sickness.